Century City is a steadily growing urban district within Makati and is home to premiere residential and commercial establishments. It encompasses 3.4 hectares of land in Kalayaan Avenue, Century City which has become a reference point in cosmopolitan living in Metro Manila. Formerly occupied by a portion of the International School Manila, it has sought to redefine the urban skyline with its architectural and design milestones. 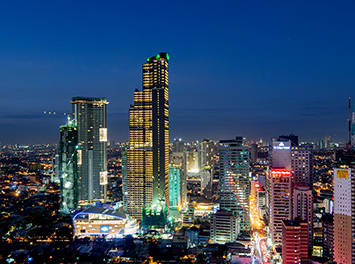 Sitting on this sought-after address are residential towers the Gramercy Residences, Knightsbridge Residences, Milano Residences (interior-design by Versace Home), Trump Tower, and Century Spire (interior design by Armani/Casa and architecture by Daniel Libeskind), premiere medical outpatient building Centuria Medical Makati, and modern retail center Century City Mall. it will also be home to Forbes Media Tower, the first Forbes-branded tower in the world. Century City is close to the capital’s significant financial centers, entertainment hubs, major shopping malls, five-star hotels, and transportation and travel hubs including the Ninoy Aquino International Airport.